Ok. We'll give this a try. you will need a flash drive. 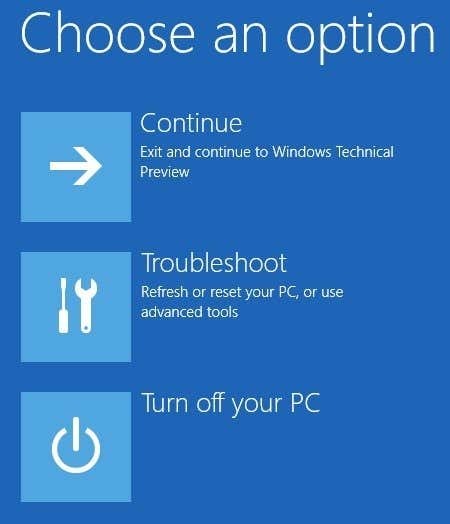 From there you can get to the Troubleshoot screen. Click Advanced options. You will see the Advanced Options screen shown below. It will create a log (FRST.txt) on the flash drive. Please copy and paste it to your reply. ok. What problems are you having? You need to download it onto a flash drive on the clean computer you have access to. Ok. no worries. Let's take a step back. Can you confirm that you have downloaded FRST onto a flash drive? Note: you need to do this on the laptop that is not infected. ok. On the infected machine are you at the command prompt? Ok. Did you manage to open notepad, go into computer and find out the drive letter for your flash drive? what was the letter?